We all know how fire works, the same way we know how gravity works. But, like gravity, there is a lot we don't know about combustion. There are many reasons to delve into its secrets. For modern culture, combustion insight could lead to more efficient fuel use and that means less pollution. Today, gasoline has amazing energy density and that makes it difficult to replace so while we research something better, more efficient combustion would mean less waste. Researchers at the Department of Energy's Lawrence Berkeley National Lab (LBNL) and the University of Hawaii have uncovered the first step in the process that transforms gas-phase molecules into solid particles like soot and other carbon-based compounds. "When you burn a flame, you start with a gas-phase reactant and then analyze the products, which include soot," says Musahid Ahmed, scientist in the Chemical Sciences Division at LBNL. "But there is no direct evidence for the chemical bonds that break and form in the process." For more than 30 years, scientists have developed computational models of combustion to explain how gas molecules form soot, but now Ahmed and his colleagues have data to confirm one long-standing theory in particular. "Our paper presents the first direct observation of this process," he says. While the research is relevant to a number of disciplines—combustion science, materials science, and astrochemistry—it's combustion science that could see the most direct impact the soonest, says Ahmed. Specifically, the fundamental chemistry discovery could be used to find or design fuels that burn cleaner and don't produce as much soot. Think about your car engine. If the combustion process were perfect, only carbon dioxide and water would come out of the tailpipe. Instead, we see fumes and particulates like soot, a visible macromolecule made up of sheets of carbon. Theoretically, there are hundreds of different ways molecules can combine to create these dirty emissions. But there has been one popular class of mechanisms that outlines possible early steps for bond making and bond breaking during combustion. Called hydrogen abstraction-acetylene addition, or HACA, it was developed by Michael Frenklach professor of mechanical engineering at the University of California Berkeley in 1991. One version of HACA works like this: during the high-temperature, high pressure environment of combustion, a simple ring of six carbon and six hydrogen atoms, called benzene, would lose one of its hydrogen atoms, allowing another two-carbon molecule called acetylene, to attach to the ring, giving it a kind of tail. Then the acetylene tail would lose one of its hydrogen atoms so another acetylene could link up in, doubling the carbon atoms in the tail to four. Next, the tail would curl around and attach to the original ring, creating a double-ring structure called naphthalene. Link by link, ring by ring, these molecules would continue to grow in an unwieldy, crumpled way until they became the macromolecules that we recognize as soot. 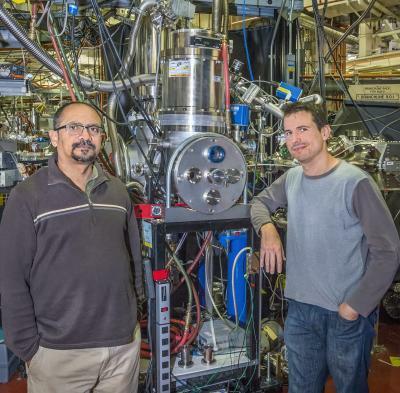 To test the first step of the theoretical HACA mechanism, Ahmed and collaborators from the University of Hawaii used a beamline at the Advanced Light Source (ALS) at Berkeley Lab specifically outfitted to study chemical dynamics. The ALS, a DOE Office of Science user facility, produces numerous photons over a wide range of energies, allowing researchers to probe a variety of molecules produced in this chemical reaction with specialized mass spectrometry analysis. Unique to this experimental setup, Ahmed's team used a so-called hot nozzle, which recreates combustion environment in terms of pressure and temperature. The group started with a gaseous mix of nitrosobenzene (a benzene ring with a molecule of nitrogen and oxygen attached) and acetylene, and pumped it through a heated tube at a pressure of about 300 torr and a temperature of about 750 degrees Celsius. The molecules that came out the other end were immediately skimmed into a mass spectrometer that made use of the synchrotron light for analysis. The researchers found two molecules predominantly emerged from the process. The more abundant kind was the carbon ring with a short acetylene tail on it, called phenylacetylene. But they also saw evidence for the double ring, naphthalene. These results, says Ahmed, effectively rule out one HACA mechanism—that a carbon ring would gain two separate tails and those tails would bond to form the double ring—and confirm the most popular mechanism where a long tail curls around to form naphthalene. Ahmed's local team included Tyler Troy, postdoctoral fellow at Berkeley Lab, and this work was performed with long-term collaborator Ralf Kaiser, professor of physical chemistry at the University of Hawaii at Manoa, and Dorian Parker, postdoctoral fellow also at Hawaii. The research was published June 20 online in the journal Angewandte Chemie. "Having established the route to naphthalene, the simplest polycyclic aromatic hydrocarbon, the next step will be to unravel the pathways to more complex systems," says Kaiser. Further experiments will investigate these follow-up mechanisms. It's a tricky feat, explains Ahmed, because the molecular possibilities quickly multiply. The researchers will add infrared spectroscopy to their analysis in order to catch the variety of molecules that form during these next phases of combustion.